Day #139 was very nearly my downfall due to an unforeseen circumstance. I got home from work, had my tea and headed off to the Colchester Radio club with my lad to see a practical demonstration of the CW leg of the 80m CC contest. All was going well until I had a ‘phone call from a colleague telling me of major problems in our data centre which required my attention. The bottom line was that I had to go into work, there was no alternative. I arranged for David to be dropped at home and shot off to work to resolve the problems. With everything working again I got home at around twenty to midnight and put the radio on quickly. I called CQ a couple of times on both 40m and 20m as they both seemed active and had no reply. I tuned around looking for someone who was calling CQ and didn’t hear anyone so I booted the computer and fired up JT65 – I spotted PY9FP in Brazil calling CQ and replied. It was an agonising 47 seconds later that I saw my callsign on the screen and the QSO went in the log at 23:58. I had two minutes to spare. No problems on day #140 though, the bands were nicely busy and I worked IG9E, a DXPedition to Lampedusa Island and then HA5AWT, Zoli in Budapest. 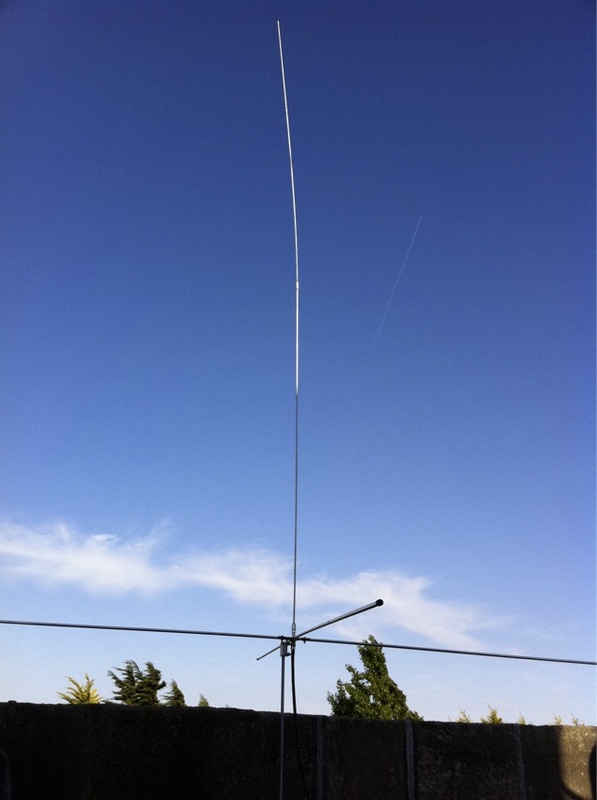 Both of these were on 10m which was pickling nicely to Europe. I then dropped down to 40m and worked GB2LST, John in Plymouth followed by DL7RML, Martin in Wiesbaden and DL7AFS, Babs at DLFF077, Kellerwald Edersee. After that I had a contact with IZ6BXV, Tony in Pescara on 20m, then 4Z13AR in Israel, a special event station for Arthur Rubinstein on 15m and then finished off the evening working IG9E again, this time on 17m. On day #141 I had just four contacts from home – I worked OK2KO, Ales on 10m then HA7TM, Tibi on 6m before switching back to 10m and working OM5MO, Otto and HB0BJP, Mirek. 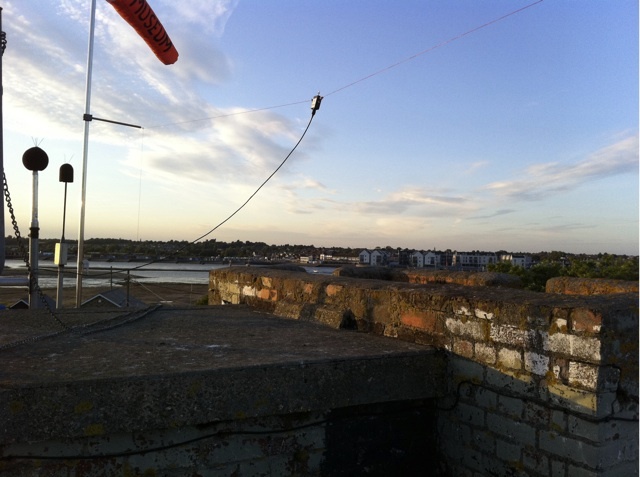 After those contacts it was time for a trip to the Martello Tower for the 144MHz May contest where we were going to put an entry in the six hour section. It was a good afternoon of radio as the contest was reasonably busy for the first hour (my stint) and then died down a bit but we ended up with a respectable score. 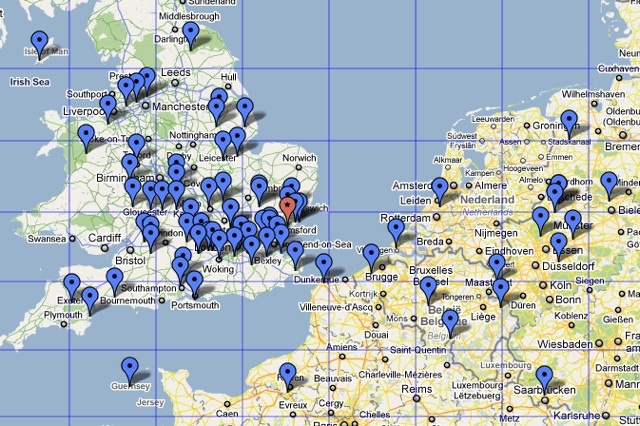 Here’s our QSO map for the day. 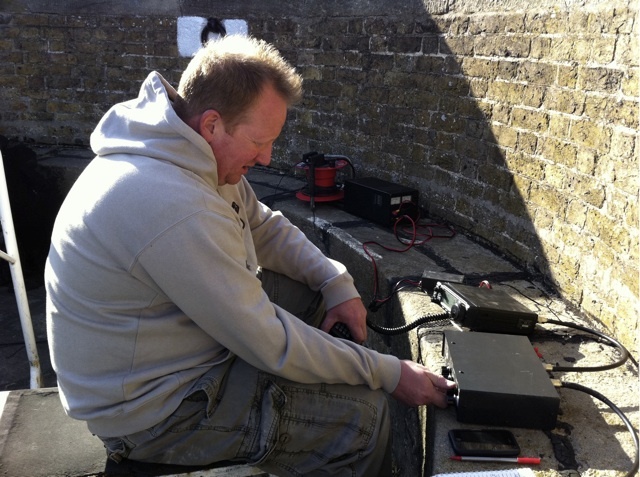 We did quite a lot of other stuff on top of the Martello Tower while people were operating. 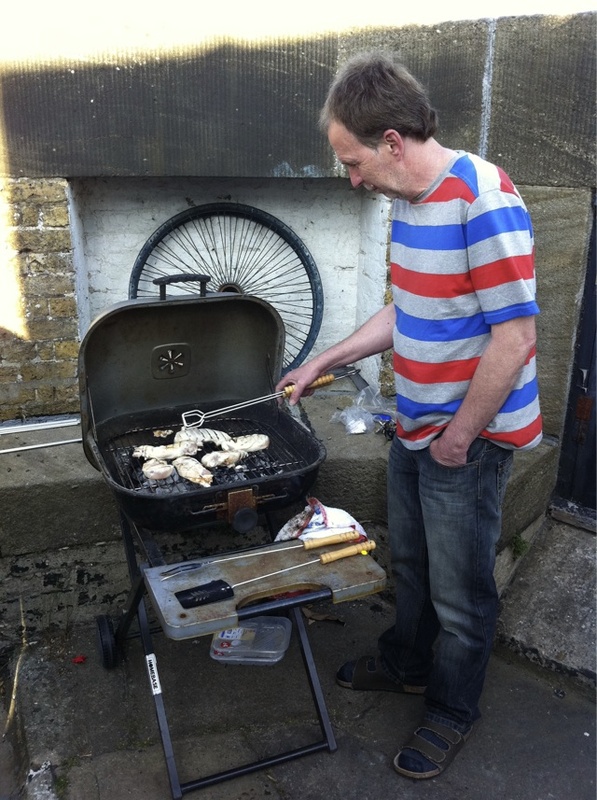 We had a barbecue on the go and here’s Richard, G7HJK hard at work, having just thrown some chicken on to cook. 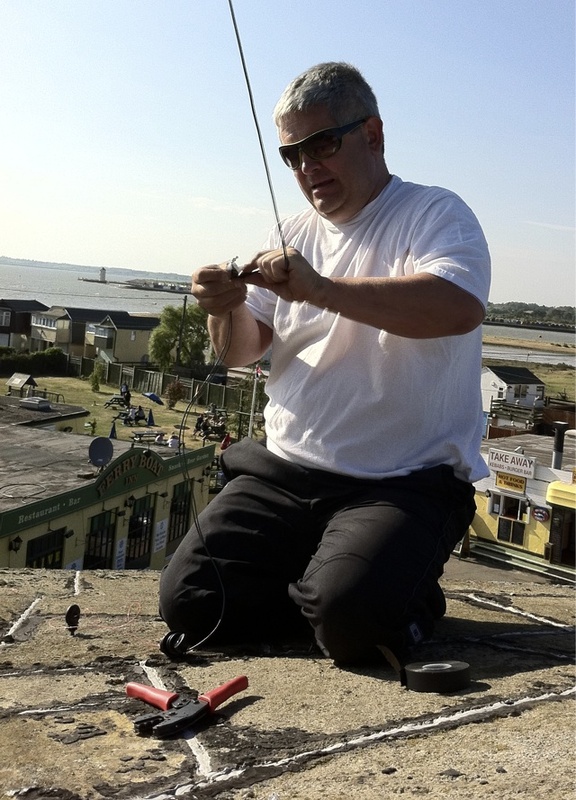 Tony, G0MBA spent most of the afternoon working on the 10MHz dipole we have installed on the Tower for our QRSS transmitter – Here he is adjusting the length (again). We set up some aerials to have a play with and one of them was simply a tank whip, mounted on a base plate with 4 radials, each around 4.5 foot long. That worked much better than expected and here you can see Yan, M0YNK tweaking the MFJ ATU which was attached to the whip. We also had a magnetic loop to try as well but sadly that didn’t work as well as the whip – We could receive on it but getting the thing to tune properly turned out to be a nightmare and almost impossible. We don’t (yet) have a good earth at the top of the Martello Tower so the problems we had may have been related to that. We have quite a lot of ‘stuff’ installed at the top of the Martello Tower now, here you can see what it looks like. 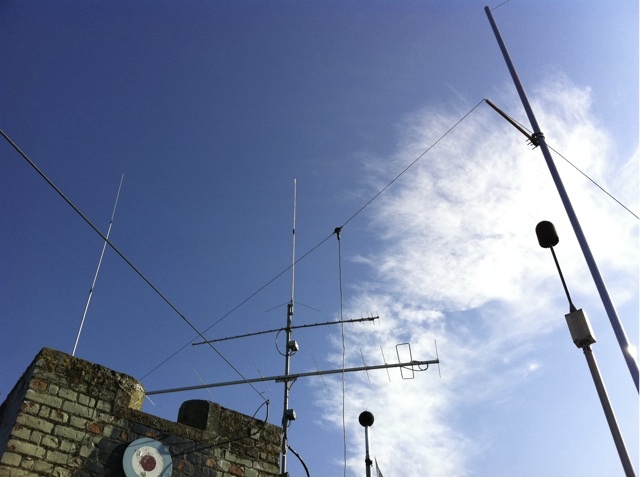 On the left is a 5/8 vertical for 28MHz which will also tune and work quite well on 20m and 15m. To the right of that is the mast with a 9 element LFA yagi on the bottom and a 19 element Tonna above it with a dual band VHF/UHF colinear right at the top of the pole. In the foreground you can see the centre of the 10MHz dipole that’s used for QRSS and the pole on the right is a flag pole which conveniently supports one leg of the dipole. The two black blobs are monitoring equipment. 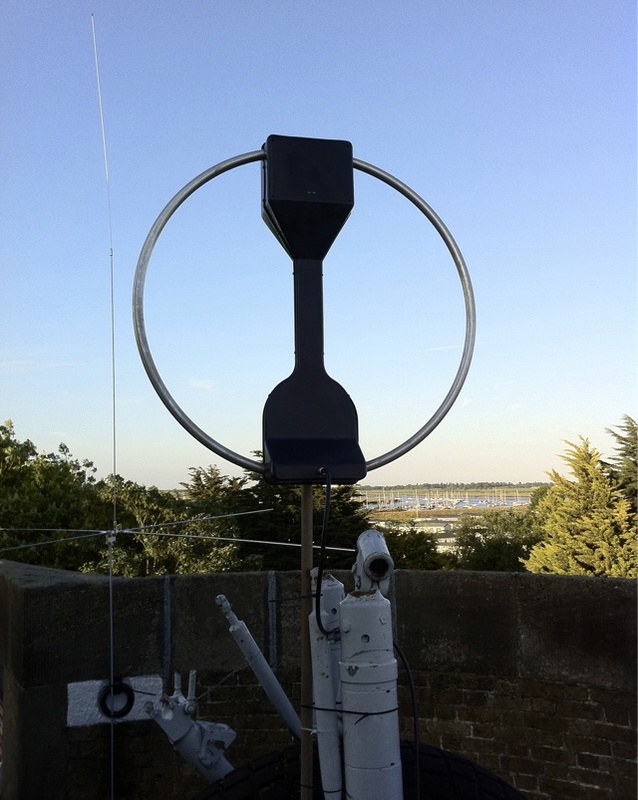 Here’s one more view of the centre of the dipole from the other side, showing the monitoring equipment and the flag. If you want to know more about the Martello Tower, you can see the official website here with details of opening times and how to join and support the museum. This entry was posted in Amateur radio, Contesting, HF, JT65, QRSS, QSO365, SSB, VHF and tagged QSO365. Bookmark the permalink.